Review: "Stream of Passion: The Flame Within" - Sea of Tranquility - The Web Destination for Progressive Music! Originally created by Arjen Lucassen, Stream of Passion's new CD entitled The Flame Within has just been released. Lucassen is not involved with the new album but that should not detract from giving the band the attention they deserve. Consisting of Marcela Bovia (lead vocals), Johan van Stratum (bass), Davy Mickers (drums), Eric Hazebroek (guitars), Stephan Schultz (guitars) and Jeffrey Revet (keyboards, synths), the band plays a brand of Gothic rock/metal with feet firmly entrenched in the style of Nightwish and related bands. But it is Nightwish who this band truly remind me of. If you are looking for something new under the sun you will not find it here. However, if you enjoy the genre and appreciate good songwriting and musicianship along with finely crafted songs this album may be for you. The songs range from heavy explorations in gothic metal, to mid-tempo numbers and soft piano laden ballads. Besides some excellent piano work from Revet, the string arrangements are quite effective and add a dramatic element to the music this genre demands. The Gothic metal scene has almost reached its saturation point, but a classy release such as this one warrants further examination. The album starts strong with the heavy Gothic metal of "The Art of Loss" containing a nice piano melody, crunchy powerful riffs and crashing drums. The Eastern tinged synths/strings are particularly provocative. "In the End" also contains an Eastern motif, with heavy and mellow sections and Bovio's vocals are excellent. The Nightwish inspired Gothic rock of "Now or Never" comes with a nice symphonic arrangement, powerful rhythm guitar riffage and layered vocals adding depth to the sound. Here Bovio's vocals bear a strong resemblance to Anette Olzon of Nightwish. The introspective ballad "When You Hurt Me the Most" slows it all down with a lovely piano intro before venturing into mid-tempo territory. The soft voice of Bovio really shines and her background vocals are spot on. The songs continue in a similar vein through the rest of the CD but I would not consider any to be filler. Most are in the 3 to 4 minute range. I would have liked to see the band stretch themselves musically with some longer compositions but what they do they do very well so I won't complain too much. Although this music does not transcend the genre, if you are a fan of Gothic metal you will want this disc. 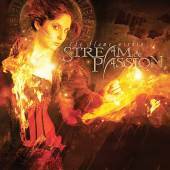 If you are unfamiliar with Gothic rock I still urge you to check out Stream of Passion as they make highly melodic and accessible music that should appeal to a wide audience. Recommended.